As with the timeless literary classics such as Tolkien’s “The Lord of the Rings” trilogy and C.S. Lewis’ “Chronicles of Narnia” series, J.C. Pilcher’s “The Age of Ornan: The Blade of Oruras Bane” (published by CrossBooks), creatively combines fantasy and Christianity in a new series of striking adventure and faith. “The Age of Ornan” is the story of Burdep, a young and fearful prince of a small people who, through a rough set of circumstances is forced to leave his kingdom with his brother and sister. 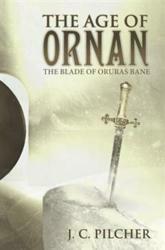 On the journey, the young hero discovers a legendary sword, The Blade of Ornan. Sword in hand, Burdep is chosen to help a racially divided group fight against an ancient evil the weapon was created to defeat. In this first installment of a three-part epic, readers follow Burdep and his siblings as they travel through the other kingdoms in the land of Domus-Lux and learn that trusting God is the only way to be successful. As a teenager, J. C. Pilcher struggled to understand his faith. In response, he wrote The Age of Ornan so that certain aspects of Christianity would be easier for everyone to understand. He currently works as a youth pastor in Martinsburg, West Virginia. CrossBooks, a division of LifeWay Christian Resources of the Southern Baptist Convention, is a Christian publishing imprint committed to bringing more Christian voices into the publishing industry. Established authors, first-time authors, and authors anywhere in between can meet their goals and fulfill their vision for their books by publishing with CrossBooks. CrossBooks’ innovative style of publishing blends the best of traditional and self-publishing. While our authors contribute monetarily to cover the cost of publishing, we maintain a strict moral and quality standard that every manuscript must meet for us to publish. For more information on publishing your Christian book with CrossBooks, log on to crossbooks.com or call 1-866-879-0502.